During the cold winter months, most folks don’t usually think of serving traditional light, crisp tossed green salads. Instead, a 'winter salad' is more appropriate for the season. Winter salads, made with roasted winter squash, have a toasty, stick-to-the-ribs quality, and are best when served slightly warm. Winter squash varieties such as butternut squash, pumpkin, acorn squash can be used as a base for some wonderful cold weather recipes - including salads! Click here for butternut squash how-to's. Here’s a hearty winter butternut squash and chickpea salad that will warm your heart and fill your tummy. Keep this recipe handy for the Lenten season which will soon be upon us! 2. In a mixing bowl, toss the squash with the minced garlic, allspice, olive oil, and salt and pepper. 3. 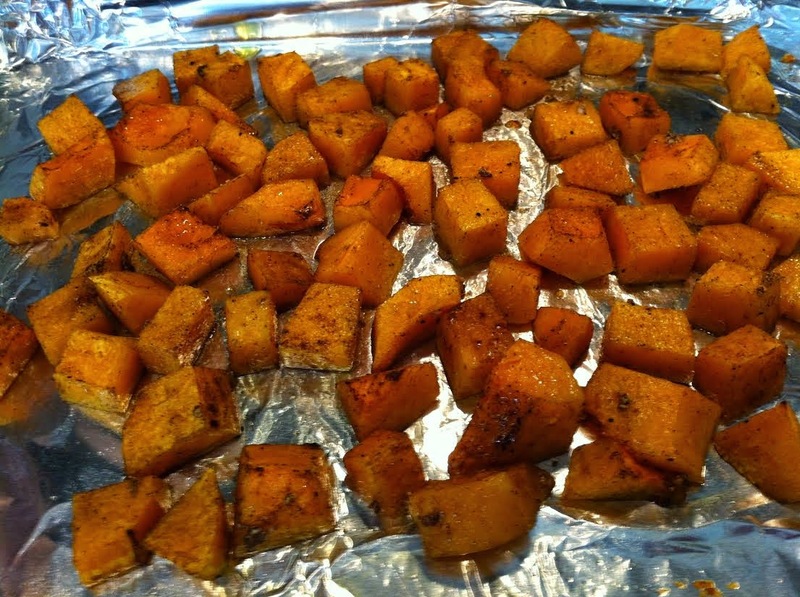 Place squash in a single layer on a baking sheet lined with aluminum foil or parchment paper. Bake for 20 to 25 minutes, or until tender. Remove tray from oven and allow squash to cool slightly. 4. While the squash is roasting, prepare the tahini dressing: Mix the minced garlic and dash of salt with lemon juice; stir in the tahini paste. Slowly whisk in olive oil. If mixture is too thick, add enough water to thin it out. The dressing should be pourable, but not soupy. Adjust seasonings, if necessary. Set aside until ready to use. NOTE: The Tahini dressing can also be used on kebabs, in wraps, on falafel, and so on. 5. 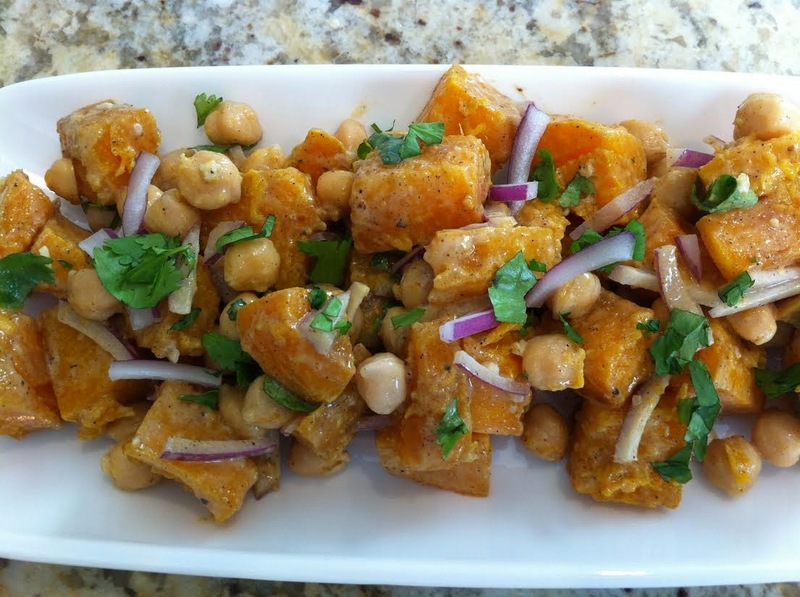 To assemble: Place the roasted squash, chickpeas, red onion, and cilantro or parsley in a mixing bowl. Add the tahini dressing and additional oil, if necessary; toss gently. Season with salt and pepper. Variation: This winter salad can be converted into an amazing soup! Place the roasted squash and chickpeas in a blender or food processor fitted with a metal "S" blade. Add 2 to 3 cups of water, chicken broth or vegetable broth. Blend or puree in several batches until it becomes as smooth - or - chunky as you'd like it to be. 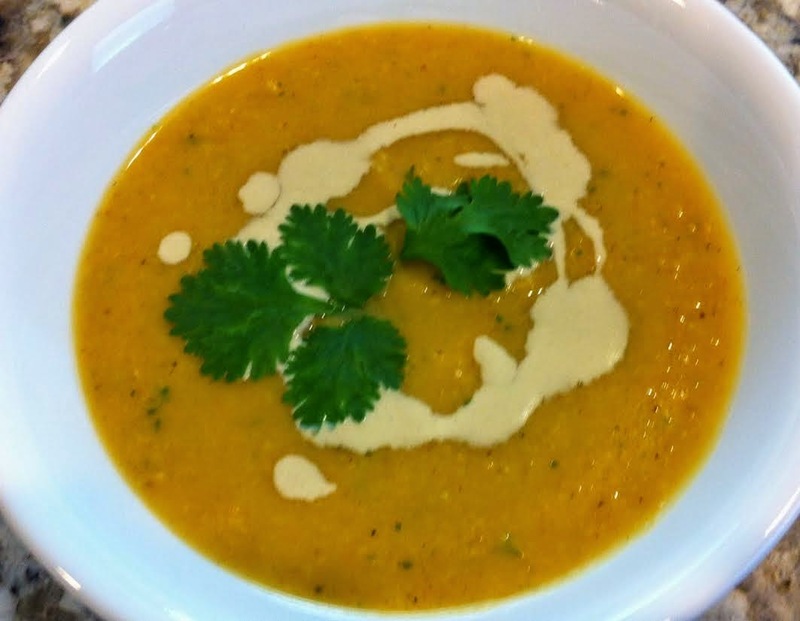 Place blended soup in a saucepan large enough to accommodate it; gently heat through. Adjust seasonings, if necessary. Garnish with chopped cilantro or parsley, thin slices of red onion, and a drizzle of tahini dressing, if desired. This looks delicious and has all my favorite ingredients. I will be making it. Thank you/shnoragalem. I hope you'll like it as much as we do. The soup variation is terrific, too!